From rolling hills to bustling market towns, the South Downs National Park’s landscapes cover 1,600km2 of breath-taking views and hidden gems. Around the South Downs you can discover the white cliffs of Seven Sisters (including mighty Beachy Head), take in rolling farmland, ancient woodland and lowland heaths or enjoy our ‘picture perfect’ villages such as Wllingdon and Alfriston, traditional country pubs or flourishing vineyards. Eastbourne is located at the Eastern fringe and since at Exclusively Eastbourne our whole reason for being is to offer you the very best holiday homes in all the best locations, it would be unforgivable if we weren’t to offer you idyllic South Downs Cottages! Based in picturesque Willingdon Village, appropriately close to the country pub, you find South Downs Cottage – Gade II-listed thanks to its history (built back in the 1750s) and offering stacks of charm and atmosphere. The South Downs holiday cottage retains many of the original features – imagine thick doors and wooden beams – but has also been modernised to ensure you’ll be toasty warm and cosy all year. Think of the invigorating hikes along the chalk hillsides or serious leaf-kicking in the woods or why not cycle along village lanes? Failing that, simply hunker down by the fire and occasionally head out to the village pubs or the fabulous Thai restaurant. There are two double bedrooms that offer good accommodation for up to four people. You’ll find direct access outside the back gate to a public footpath that will lead you on to the beautiful South Downs National Park. You should also consider Little Friston Lodge, located just off the South Downs Way in Friston, close to the village of East Dean – the perfect position from which to enjoy Beachy Head, the Seven Sisters and along south coast of England. The lodge is an annexe to a large country house and provides luxury holiday accommodation for up to four people. 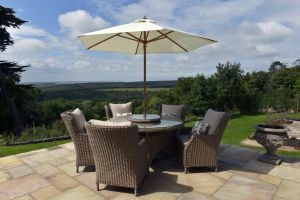 The views over the South Downs are truly inspiring and if you head outside your door you can enjoy the full, expansive gardens that belong to the main house as well as the patio immediately outside your cottage. Patio areas include outdoor dining furniture, seats for relaxation and a BBQ if you fancy cooking al fresco, and there is an attractive pond providing a haven for wildlife or simply head inside for the handsome log-burning fire (with logs included). 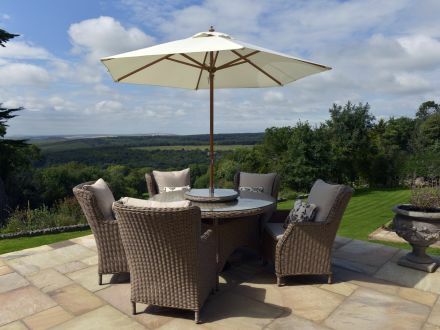 Why not give us a call on 01323 40 60 90 or email info@exclusivelyeastbourne.co.uk to let us find the perfect South Downs holiday home for you or you check our availability online and book here.